In her book titles Carolyn Baker features such scary words as “demise,” “chaos” and “collapsing,” but her goal is mainly soul building. The stressful outer reality is a provocation. 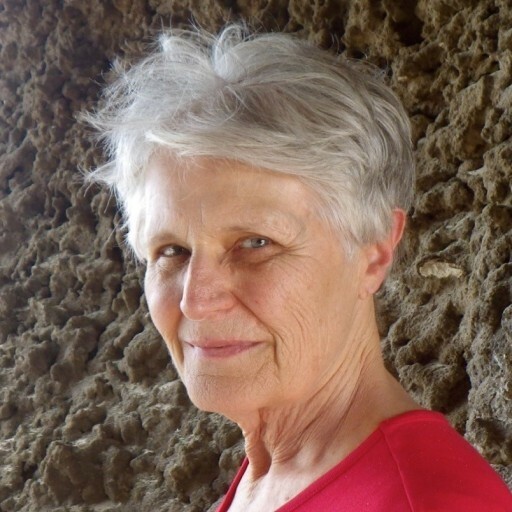 In Baker’s daily digest of challenging news (“Speaking Truth to Power”), she welcomes a whole range of “collapse-aware” writers, including those who predict “near-term extinction.” However, her main vision is that, in the course of growing up, humans will construct, sooner or later, a better society, and in any case will live intensely in the present. She is like the stern teacher with a heart of gold. After working as a psychotherapist and a teacher of psychology and of history, she concluded that industrial civilization is ending, especially as she read about climate change, financial instability, and accidents in nuclear power. While knowing the suffering this collapse would bring, she has a mission and a dream. The mission is to prepare people before their world falls apart, so they won’t be surprised and fall into panic and traumatic depression. Her dream is that a better society will arise as we wisely prepare for and resiliently move through a period of suffering. 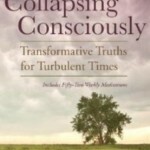 Her most recent book, Collapsing Consciously, takes the form of 17 essays followed by 51 brief meditations. (As submitted, Baker’s manuscript had 365 meditations, but the publisher suggested that she keep enough in the main book for weekly use and put the other 313 in an ebook, which uses the same cover photo and title plus the word “meditations.”) Each of the short pieces begins with a quote from another author, after which Baker expands on the theme. In an era of specialization, it’s refreshing to encounter the fruits of wide reading. For example, Baker draws on activists (Rob Hopkins, Bill McKibben); classic authors (Fyodor Dostoyevsky, Emile Zola); current fiction writers (Annie Dillard, Flannery O’Connor, Michael Ventura, Alice Walker); historians (Karen Armstrong, the author herself, Elaine Pagels); movie directors (Ridley Scott, Steven Soderburgh); musicians (Cat Stevens, John Lennon); mystics (Hildegard of Bingen, David Steindl-Rast); natural ecstatics (Hafiz, Kabir); recent and contemporary poets (Denise Levertov, Antonio Machado, W.S. Merwin, Pablo Neruda, Rainer Maria Rilke, William Stafford, David Whyte); psychologists (Carl Jung, Abraham Maslow); psychotherapists (M. Scott Peck, Bill Plotkin, Frances Weller); social observers (Barbara Ehrenreich, Duane Elgin, Derek Jensen, Rebecca Solnit); spiritual leaders and memoirists (Father Thomas Berry, Pema Chodrun, Peter Kingsley, Jiddu Krishnamurti, Eckhart Tolle); other workshop leaders (Angeles Arrien, Michael Meade, Margaret Wheatley); and writers on the end of our current civilization (John Michael Greer, who contributed the foreword to Collapsing Consciously, Richard Heinberg of the Post-Carbon Institute, James Howard Kunstler, Dmitri Orlov). To cite a distinction made famous by Isaiah Berlin, about the fox who knows many things and the hedgehog who knows one big thing, Baker is foxy in her range of interests, hedgehoggy in her singular passion. Her passion is growing up as a species, or transforming while there’s still time. She sees a culture of 2-year-olds. She feels we can do better. This brings us to a peculiar category of human experience: to the kind of challenge that almost nobody would dream of choosing, but which, when thrust upon us and met, can yield gold. For example, this challenge could be a life-threatening illness. It’s not something you can fully experience at a workshop (though Baker does lead groups in the exercise of imagining their own deaths). A life-threatening challenge can ruin a person, or it can serve as an occasion for rapid and precious growth. How does Baker see the challenge of collapse? In her view, it won’t be easy but for some people, if prepared, it will deepen their souls and engage them more fully in life. Baker knows that people tend to define a comfort zone in which they feel competent, and then to get bored even as they feel secure (or worse, not even to notice how bored they have become, how little they are developing.) She encourages not warding stuff off but experiencing it fully, and venturing out to encounter more of the mystery. If you respond to the meditations in the main book, consider downloading the e-book and enjoying the other 313 as you move through the next year. One of them begins with an excerpt from Clarissa Pinkola Estes: “What do I know should die, but am hesitant to allow or to allow to do so? What must die in me in order for me to love? What not-beauty do I fear? Of what use is the power of the not-beautiful to me today?” The prospect of collapse is not-beautiful. Baker shows us the use of it.